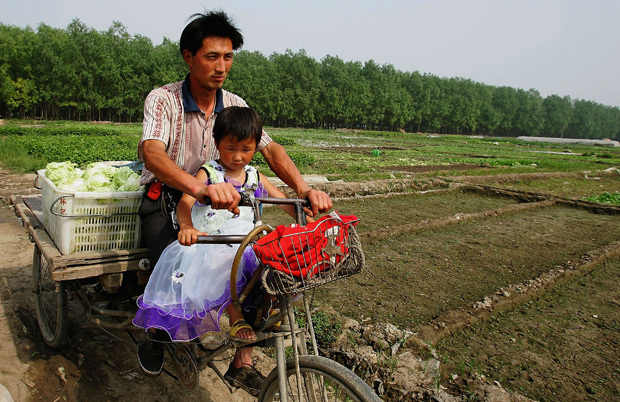 A migrant worker rides a bicycle with his daughter on a field in Beijing, China. By Hu Shuli. This editorial was first published by Caixin. The expected launch of land reform is dividing opinions. At a work meeting this month, the Minister of Land and Resources, Jiang Daming, said the central government would limit land supply in cities with more than five million residents. His words ignited a storm. To be fair, he spoke in the spirit of the resolution from the recent Third Plenum of the Communist Party’s Eighteenth Central Committee. At a work meeting on urbanization last month, leaders made it clear that the focus of urbanization in the country’s three major centers would be on making better use of the land already at their disposal. “Not every town or city needs to grow huge,” they stressed. Now, by setting a target of cities with five million or more people, Jiang appears to be extending the scope of planned restrictions. Hence, the public reaction. Whatever the specifics, the government’s plan to put existing land to better use is worth noting because it goes to the heart of China’s land-related problems. Fully utilizing the country’s stock of land for development will take it closer to its goal of sustainable urbanization. The figures are worrying. The physical landscape is urbanizing faster than the population: from 2000 to 2010, the area of urban development across the nation increased by 64.45 percent while its urban population grew by 45.9 percent. Studies also show that the population density in Beijing and Shanghai is far lower than that in other cities, such as Tokyo and Seoul. At the same time, developing farmland remains the focus of officials, not least through the sale of government sites by way of auction, tender, and listing. Under current laws, rural land is collectively owned and must be expropriated by governments before it can be sold on the market. According to the State Council’s Development Research Center, the sale of government-expropriated land makes up 40 percent of land sales revenue. Such a model of revenue generation is unsustainable. The central government’s plan to ease restrictions on the use of collective land is timely. Urbanization in this country is challenging, given its complex land management system, and is further complicated by problems that come with an economy in transition. In the three megacity clusters of the Yangtze River Delta, the Pearl River Delta, and the Beijing-Tianjin-Hebei region, land available for use is made up of government land and collective rural land; the latter is to be used for commercial, community, or residential development. Market distortions involving rural land are more serious, so that’s where reforms can be most helpful. Take Beijing’s recent move to allow rural land to be used for the reconstruction of fifty “urban villages,” covering an area of eighty-nine square kilometers, about the size of the old city center. There are some 337 such urban villages in land-scarce Beijing. If they can all be put to better use, Beijing authorities will have reason to cheer. The Third Plenum resolution clearly calls for allowing collectively owned buildable rural land to be put on the market, enjoying the same rights and prices as government land. This should be the foundation of the country’s land reform. How should such land be used? Some have argued that it should be used only for commerce, rather than for community or residential development. But imposing such restrictions will impede the government’s eventual goal of unifying the market for rural and urban land. Besides, in the more developed coastal areas, collective rural land is often already used for a mix of purposes, and illegal transfers are becoming more common. In recent years, too, tussles over land rights have erupted into violent protests and stand-offs between residents and officials. Officials ought to heed the Plenum’s call to push for land reform, based on the principle of equal rights for both rural and urban land. A systematic overhaul is needed to truly transform the land market. It should enable collective rural land to be openly bought and sold in the market. The government-directed land management system of "auction, tender, and list" is reaching its expiration date. The government can introduce change in well-ordered steps. First, it must recognize the land rights of rural residents. Second, it should include collective rural land in urban planning and ensure it has equal legal status. Third, it must ensure an open market for its trade, with fair determination of prices and no restrictions set on its entry. Fourth, tax reform should follow, including reorganizing the government’s use of land sales revenue. In the longer term, the government should also consider amending a clause in the constitution that stipulates that the urban land belongs to the country. Where urbanization is concerned, the problems of land reform are complicated with the problems of hukou reform, making change more difficult. As the Third Plenum resolution pledges, the market should play a decisive role in resource allocation. This must be the case in China’s land reform.